The Spectrogram, shown here as it was in 1966, was used to control the output of the Sine bank, or the Multi-track (Special Purpose) Tape Recorder. 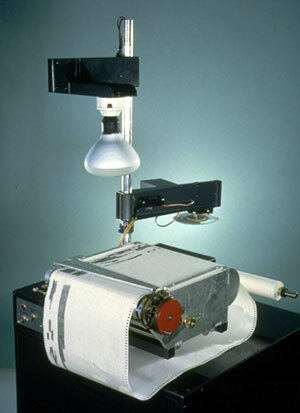 The chart paper moved past a series of light sensitive switches and was illuminated by the light above the instrument. When the light was blocked by a darkened area of the paper, the sound generator would be turned on. A row of one hundred photocells read the information from the ten-inch-wide graph paper which was marked with ink at points where the sound was to be activated. As the dark sections of paper passed the photocells, the appropriate number of oscillators generated the sounds. By October 1959, Le Caine had synthesized several bird sounds with the Spectrogram, which he played at a conference of the Audio Engineering Society. Le Caine was interested in the study of bird sounds because of their similarities to electronic sounds. 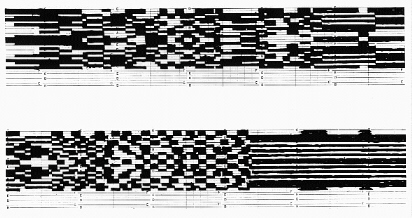 Part of the score for Bird Spectrogram.